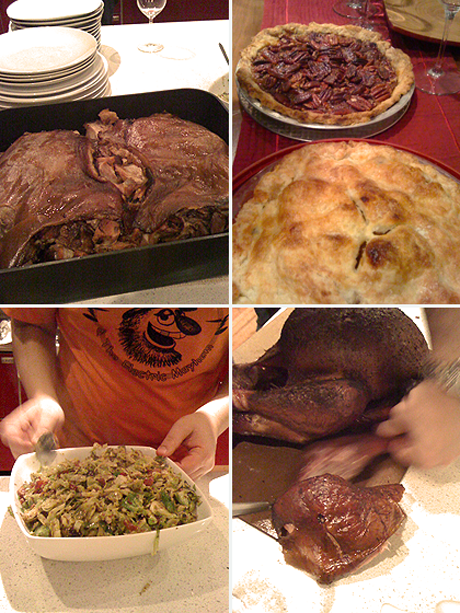 Fellow Foodist, Anthony Nicalo invited a houseful of rowdy food lovers to his American Thanksgiving dinner. In preparation for the evening, he slaughtered a 200 lb pig two days prior to feed the hungry guests. We all contributed either a dish or a hand in the kitchen. Following the pre-dinner’s counter space jostling, pot and pans scrubbing, stove-top sharing, wine spilling, and all forms of laughter amidst chaos, an amazing spread gathered us in appreciation and gluttony. Amongst those in attendance were some of the Foodists contributors. Here, they welcomed me warmly into the community. So as my first post, I’m keeping my word to share my hors d’œuvre recipe. Pan fried (or even deep fried) polenta is a wonderful alternative to bread or crackers as a base for toppings. For Holiday parties, it can be made days ahead, stored in the fridge, then cut and fried when the guests arrive. Hint: Finishing the polenta in the oven means less stirring and prevents it from burning at the bottom. Rosemary polenta cut and ready to fry. Chop rosemary leaves finely and add to the boiling pot of stock and water. Add the polenta in a slow stream and stir vigorously to prevent lumps. Cover and place into the oven for 40 minutes, stirring every 15 minutes. After 40 minutes, remove from the oven and whisk in the Parmesan cheese. Pour polenta into an oiled baking dish, cover with cling-film, and refrigerate for at least 2 hours. De-pit and chop olives, set aside. Core and slice fennel bulbs, toss with olive oil, s&p, spread in one layer on a baking sheet. Roast in the oven alongside the polenta for 20-30 minutes until caramelized, stirring midway through. When fennel is ready, add olive oil to a pan set over medium heat. Add minced garlic and drained anchovies, break the fillets apart. After 2 minutes or when the garlic is lightly golden, add the roasted fennel. Add vinegar. Remove from heat. 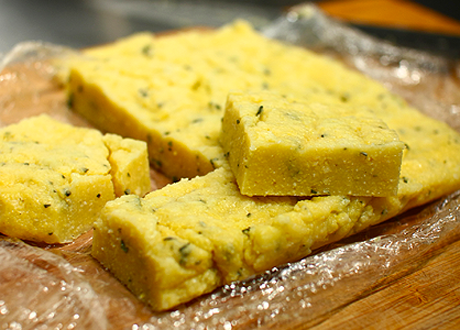 Cut polenta into desired shape and size. Pan fry until golden brown and crispy in a non-stick skillet. Top with the fennel and anchovies topping, followed by the chopped olives. Serves 6 as main course, or up to 20 as appetizer. This was a fantastic hors d’oeuvre. Mouth watering. I recall now I bumped you out of the pan you were using and then didn’t wind up using it because it wasn’t big enough. Sorry. Great to meet you. 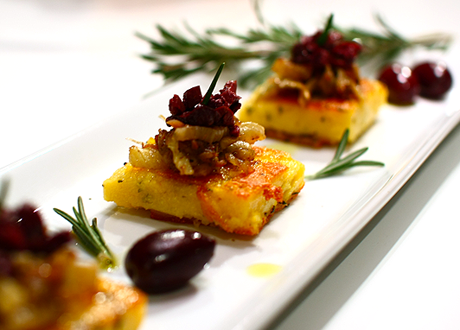 Beautiful photo of the polenta! welcome! and thanks for the recipe, it was delish. @Evan, no prob. Your risotto more than made up for the boot. @Anthony, you're such a food dork. Useful material. Better not express my beliefs here simply because I am somewhat opinionated. It can be very important to have ideas though. Although, if persons ought to have , the best detail to do will be to check out.